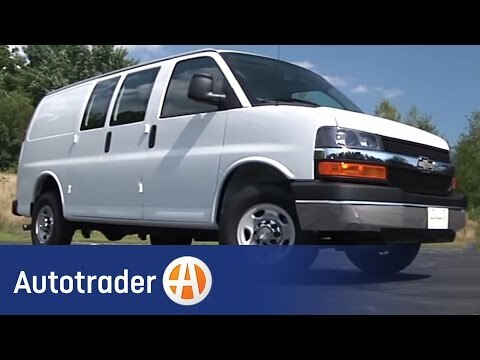 If you have a business and need a substantial amount of room for tools or storage, the 2008 Chevrolet Express Van is hard to top. A choice of four powerful V8 engines, varied towing capabilities and optional all-wheel drive makes the Express Van perfect for business and family use. It is made for working hard and it will work hard but there are blind areas. Like the height it gives when driving, and the frontal vision clearance. Wish it was passenger van and not cargo. Feel there are too many blind areas in the cargo van. A rear view camera would help. Would also like better gas mileage. The Chevrolet Express van is reliable. I recommend it for large families. We bought our Chevy Express van when it was 3 years old from a rental company. We wanted to have enough room for our large family. We are able to travel in comfort. We haven't had any major problems with it. GM IS RECALLING 151 MY 2008 CHEVROLET EXPRESS AND GMC SAVANA VEHICLES EQUIPPED WITH ALL WHEEL DRIVE (AWD). SOME OF THESE VEHICLES HAVE TRANSFER CASES THAT WERE MANUFACTURED WITH AN INCORRECT PART THAT CAN CAUSE EARLY FAILURE OF A DRIVE CHAIN. IF THE CHAIN BREAKS, SHIFTING THE TRANSMISSION TO PARK MAY NOT KEEP THE VEHICLE STATIONARY. IF THE VEHICLE IS PARKED ON AN INCLINE OR BUMPED, IT MAY ROLL AND STRIKE A PERSON, OBJECT, OR ANOTHER VEHICLE WITHOUT WARNING, AND CAUSE PERSONAL INJURY. DEALERS WILL INSPECT THE TRANSFER CASE DATE CODE AND, IF NECESSARY, REPLACE THE TRANSFER CASE. THE RECALL IS EXPECTED TO BEGIN ON OR ABOUT AUGUST 15, 2008. OWNERS MAY CONTACT CHEVROLET AT 1-800-630-2438 OR GMC AT 1-866-996-9463. GM IS RECALLING 2,481 MY 2008 CHEVROLET EXPRESS AND GMC SAVANA G-CUTAWAY FLEET VAN EQUIPPED WITH A 6.0L (RPO LY6) V8 ENGINE, 4L80E (RPO MT1) TRANSMISSION, 4.10 (RPO GT5) AXLE AND 75 MPH GOVERNOR (RPO 9D7). THESE VEHICLES HAVE A CONDITION IN WHICH THE TRANSMISSION MAY BE DAMAGED DUE TO FIRST GEAR ENGAGEMENT AT HIGHWAY SPEEDS AND THEN DOES NOT TRANSMIT POWER WITH D4 OR R SELECTED. THIS MAY BE PRECEDED BY ENGINE SHUTDOWN IF THE VEHICLE EXCEEDS 81 MILES PER HOUR IN CERTAIN CONDITIONS. THE VEHICLE MAY BE STRANDED ON OR NEAR A HIGHWAY, INCREASING THE RISK OF A CRASH. DEALERS WILL REPROGRAM THE TRANSMISSION CONTROL MODULE AND ENGINE CONTROL MODULE FREE OF CHARGE. THE RECALL IS EXPECTED TO BEGIN ON JULY 30, 2008. OWNERS MAY CONTACT CHEVROLET AT 1-800-630-2438 AND GMC AT 1-866-996-9463. GM IS RECALLING 567 MY 2008 CHEVROLET EXPRESS AND GMC SAVANA CUTAWAY VEHICLES WITH A 139" WHEEL BASE. THE FRAME RAIL ON THE DRIVER'S SIDE MAY BE WIDER THAN SPECIFICATION. IF THE FRAME RAIL IS WIDER THAN SPECIFICATION, OVER TIME IT MAY CONTACT THE FUEL TANK HOUSING, RESULTING IN A POSSIBLE FUEL LEAK. FUEL LEAKAGE, IN THE PRESENCE OF AN IGNITION SOURCE, COULD RESULT IN A FIRE. DEALERS WILL INSPECT THE CLEARANCE BETWEEN THE FRAME RAIL AND FUEL TANK HOUSING AND WILL REWORK THE FRAME RAIL IF NECESSARY FREE OF CHARGE. THE RECALL IS EXPECTED TO BEGIN ON JULY 30, 2008. OWNERS MAY CONTACT CHEVROLET AT 1-800-630-2438 AND GMC AT 1-866-966-9463. CUMMINGS IS WORKING WITH RICON TO CORRECT THE WHEELCHAIR LIFTS FREE OF CHARGE (PLEASE SEE 07E095). THE RECALL IS EXPECTED TO BEGIN ON OR ABOUT OCTOBER 6, 2008. OWNERS MAY CONTACT RICON AT 1-818-267-3000 OR CUMMINGS AT 1-763-498-7887.